Lawrence was the son of Iva High and Elwood Moore of Lot 9 Concession 13. He enlisted in 1941 and trained as an Air Engine Mechanic with the 435th Squadron (Chinthe). In 1943, he was shipped out and worked as a mechanic on the Dakota planes. 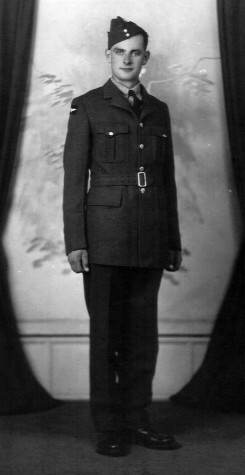 He served in Canada, England, India, and Burma. In 1946, he was honourably discharged and purchased Lot 11 Concession 13, East Nissouri Township. He passed away in 2000 and is buried in Kintore Presbyterian Cemetery, Kintore, Ontario.